NIS America not localizing the Xbox One version. NIS America is bringing Psycho-Pass: Mandatory Happiness to North America and Europe for PlayStation 4 and PS Vita both physically and digitally, and to PC via Steam, in fall 2016, the company announced. The 5pb.-developed visual novel first launched for Xbox One in Japan on May 28, 2015. The PlayStation 4 and PS Vita versions aren’t due out in Japan until March 24. The PC version is new for the western release. 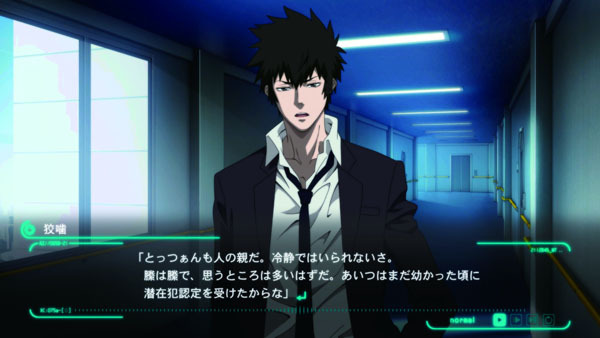 Set during the time-span of the first season of the Psycho-Pass anime series, Mandatory Happiness adds backstory and world building to the overall series, as well as in-depth story-lines to each of the newly introduced characters. The player will be faced with a “multitude” of decisions that ultimately change the outcome of the game. NIS America is holding a press event in San Francisco later this evening. We imagine news of the localization was supposed to be embargoed until then, but their European press site went up with the information early. Thanks, DualShockers, for the notice. Get the trailer and fact sheet below. View a set of screenshots at the gallery. For the public’s welfare, all emotions and thoughts are documented and managed by the Sibyl System. This system measures the quality of each person’s life by what is known as the PsychoPass, a reading of an individual’s mind. Broken down into two main components, the PsychoPass is the system’s omniscient eyes of justice. One of these components is the Hue, which is a visual representation of the Psycho-Pass that conveys a person’s stress level. The other is the Crime Coefficient, which is a numerical value that represents a person’s criminal capacity. This number determines whether an individual requires enforcement by the detectives of the Public Safety Bureau. Detectives are divided into two groups: Enforcers, who are tasked with the investigation of crimes and the apprehension of criminals, and Inspectors, who are charged with managing the Enforcers. You must decide the best course of action for each given situation, but regardless of the hierarchy that separates Inspector from Enforcer, players must be mindful that every decision has its own repercussions. With an intricate decision-making system, Psycho-Pass: Mandatory Happiness offers a twisted plot and compelling cases, providing a number of different endings. Ultimately, depending on the choices made, Hues may deteriorate beyond recovery, cases may be left unsolved, and the game may end quicker than expected.